Natasha: It's our anniversary! 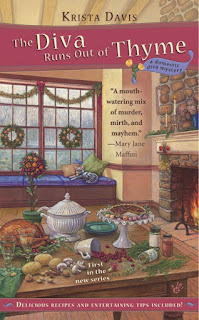 The Domestic Diva Mysteries started at Thanksgiving. Sophie: I won't soon forget that dinner. How often do you sit down to eat with a killer at the table? Sophie: We will. On Thanksgiving. And on the 25th and the 26th and -- there's a lot of celebrating going on this month. Natasha: It happens every year. Why are you acting like it's different? I've finished my gift shopping. The house is decorated for Christmas, except for the tree, and I've baked my Christmas cookies. The only thing that remains is decorating Francie's house. Sophie: Not that again! Francie hates it when you slip over there in the dark of night to hang lights and wreaths. She does her own decorating. Leave her alone. Natasha: You have no holiday spirit. Probably because there's not a single sparkly decoration up yet in your house. Sophie: Not true! I have loads of holiday spirit. And so do the other Killer Characters. Natasha: Oh, them. Jaymie Leighton is the only one with decorations up. Sophie: That's because they're all getting ready for the Have A Cozy Christmas Countdown. Now that's real holiday spirit! Natasha: I should invite all the characters to my house for a holiday party. Sophie: Yeah, why don't you do that? I'm sure they'll all want to come after that murder at your Halloween party. Natasha: Must you bring that up at every opportunity? People should be in awe of my entertaining abilities but all they remember is the dead guy. Besides, all the characters have had their own problems with corpses. They're not exactly in a position to be critical of me. Sophie: Well, maybe not for that, anyway. Natasha: So how does it work again? Should my party have a book theme? Sophie: How about a Have a Cozy Christmas theme? Natasha: Cozy. Mmm. That's really not my style. Sophie: You'd better hurry. The Have A Cozy Christmas Countdown starts November 26th. Natasha: Can I enter? I've been wanting to read some of those books. Sophie: No! You're ineligible. We want our readers to Have a Cozy Christmas so we're giving away a book every day until Christmas. But you could still throw a party for the other characters. Natasha: Do you think Dorothy Parker would come? She parties with some very chic and famous people! Do you think it's true that she makes gin in a bathtub? Sophie: You'll have to ask her. 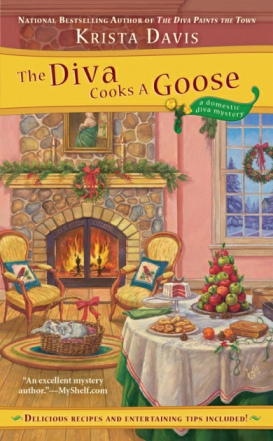 In the meantime, help me spread the word about the Have a Cozy Christmas Countdown, will you? Natasha: I have to do everything. Okay, how does it go? Sophie: We want everyone to Have a Cozy Christmas so the Killer Characters are giving away a book a day from November 26th through December 25th. To enter all they have to do is leave a comment and come back the next day to find out if they won. It's that simple! A countdown! Gifts! And a party at Natasha's! Count me in! Gifts, wow what a treat and I don't have to stand in line at a store. Can't wait till the next installment about Sophie comes out. what a great way to kick off the Holiday season!!! thank you!!!! Well, now, who's been sneaking a peek at my house?? I try to beat everyone else getting my lights up and the urns of greenery and holly in front. 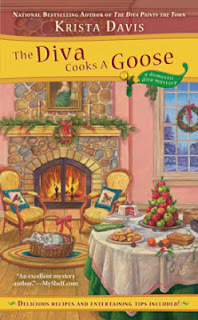 And I'm so excited for the Cozy Christmas Countdown... who doesn't want to win books and gifties?? Whee!! See you all here! Love these authors and love free books, thank you all!!! What a geat thing to do for all the fans! Cozy Authors ROCK!! So generous!! this is going to be fun!! Thank you so much for sharing books with all your adoring fans. We do love you for that. 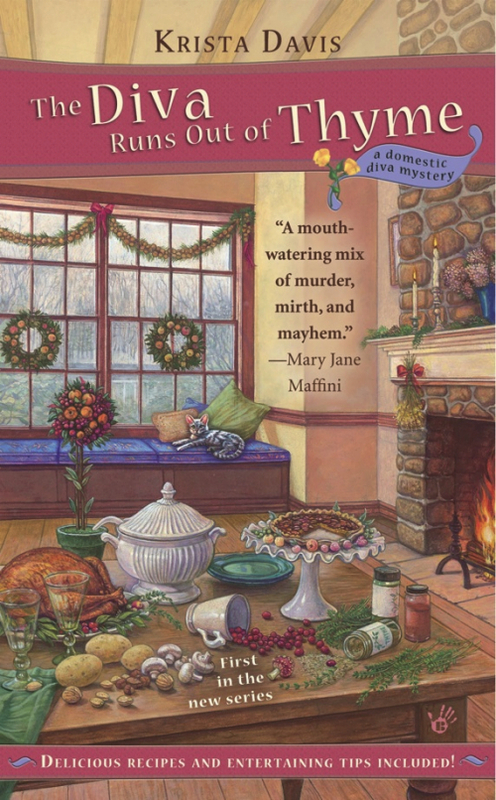 Nothing cozier than curling up with a cozy mystery in front of the fireplace over the holiday season. Thanks for the giveaway! Thank You for caring about your fans. Happy Thanksgiving and have a Wonderful Christmas. What a great present to your readers. 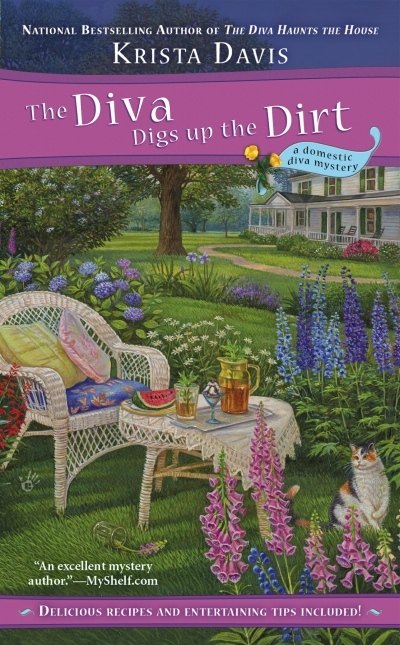 The Diva series is one of my favorites. What a great way to start the Christmas season!! With "cozy" books! Thanks everyone! All the characters and their authors love our readers. We really do want you to have a Cozy Christmas! Hmm, Nora, you may have just given me an idea for a storyline! LOL! Beware, Natasha! Thank you all for your kind words. I hope you all win a book! I love Christmas, I love books, I love the scent of both! I also love free things! Bring them on! Love these books! Thanks for a chance to win one. I love reading cozy books at work, what else would I do there? I hope Sophie and Mars finally get back together if Natasha disappeared! I had this great idea to have all my decorations up and festive before my husband and I left for our Thanksgiving trip to our daughter's home. I could then come home and bake, shop and wrap while pretending the elves came in to create a Christmas wonderland just for me! Not to be. My poor old leg muscles had other ideas and they flat gave out on me. My husband's mantra "Sit down and read a book! We will finish this when we get home." Reading is my one real relaxation. Well that and my pedicures! By the way, love the recipes - have tried a couple and they were really tasty.